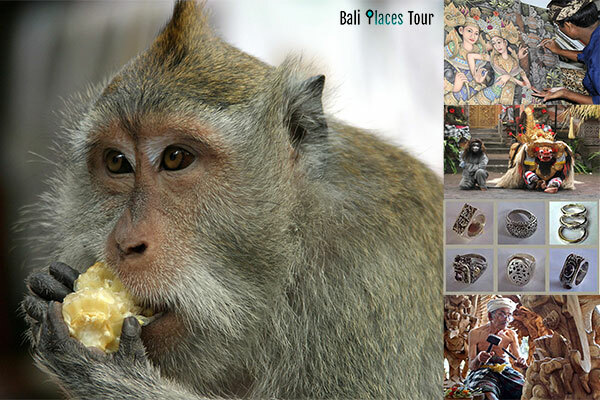 Bali Ubud Tour sightseeing is a package of half day trips to visit the interesting tourist attractions in Ubud area, e.g. art villages, Ubud sacred monkey forest, Ubud palace, and the Saraswati temple (The Lotus Temple). Ubud excursions is a trip package that is included in Bali half day tours packages category within 5 hours to 6 hours to go to the best and popular tourist sites that are located in the region of Ubud and the surrounding area of Ubud Bali. Ubud day tour is one of the most chosen Bali tour packages in a half-day itinerary instead of Kintamani volcano tour with Ubud village which has the duration time in a full day to see Bali volcano, rice terrace and also the attractions in Ubud town. Ubud is a town on the island of Bali Indonesia, it is situated among rice paddies and high ravines in the main foothills of the Gianyar regency. Ubud is regarded as Bali's primary arts and culture centers and one of the best tourist destinations in Bali, it has developed a massive tourism industry. Along with that, there are many available books and articles about Ubud travel guide to help travelers exploring the places of interest in Ubud, Bali. Ubud has a human population of around 30,000 people. In recent times, it has become demanding to recognize the town itself from the villages that are around it. The area around the town consists of little farms, rice fields, and also dense forest. Below we have chosen the itinerary of Ubud tour with the selections of most visited tourist destinations. Please noted that this trip is a private tour and it's flexible, it means that you can skip the places that you don't want to visit and we can replace to other places but still in the location of the surrounding Ubud area with the same duration of time provided. Check also our tour packages in Bali in full day if you would like to choose for other options of package tours in Bali. Ubud trip is accompanied by our professional friendly Balinese tour driver with a comfortable vehicle for transportation (car, minivan, or bus/for the group). The first places that will be visited on Ubud tour excursions are the Batubulan village to watch the Barong & Keris dance performance. Batubulan is also well-known for the center of stone carvings in Bali. 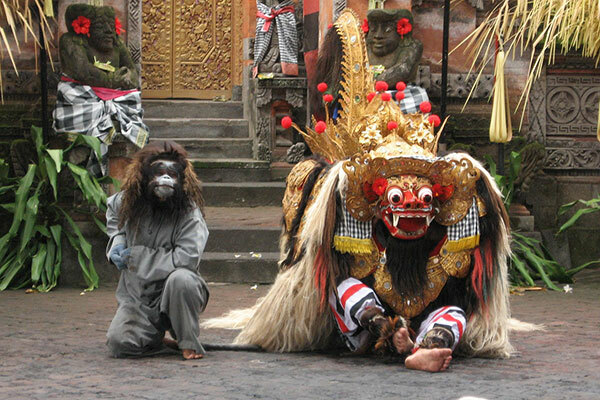 Barong is a lion-like creature and figure in the mythology of Bali, Indonesia. Barong is actually the king of the spirits, master of the hosts of good, and opposition of Rangda, the demon queen and mother of all the spirit guarders in the mythological ethnicity of Bali. The fight between Barong and Rangda is presented in Barong dance to signify the endless battle between good and bad. Celuk is included in the list of Ubud tour package itinerary, the location from Ubud town is about 11,5 km or around 25 minutes. Celuk is the well-known village on the island as a touristic region because of its local residents are really active and rich in creativity to the gold and silver jewelry manufacturing. All of these silver and goldsmiths perform their work in contemporary designs in times when they are requested. Along the main roads, we are able to find out many art shops. 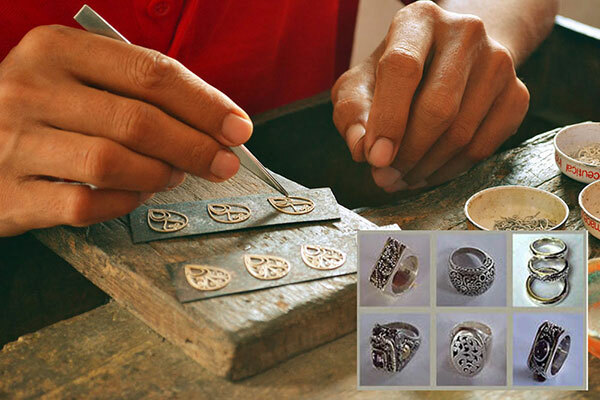 Every art store provides a workshop where the tourists are able to see the artisans creating handcrafted jewelry. Batuan is also added in our selections of Ubud day trip, its location is approximately 9 km or just about 20 minutes from Ubud. Batuan is a village on Bali island, Indonesia. Batuan is known for its fine art and style of painting which started in the village in the 1930s and has since appeared into a major Balinese art style, often called a Batuan hand painted drawing. It is by far the main painting center and also has several art galleries and cooperating art society that has played an important part in promoting the art painting of Batuan. The next stop of Ubud sightseeing tour is to see Mas wood carvings. Mas is a village in the district of Ubud, Gianyar regency, Bali. Mas is famous for its wooden handicrafts and furniture with very good export quality and well treated as well as inspected. 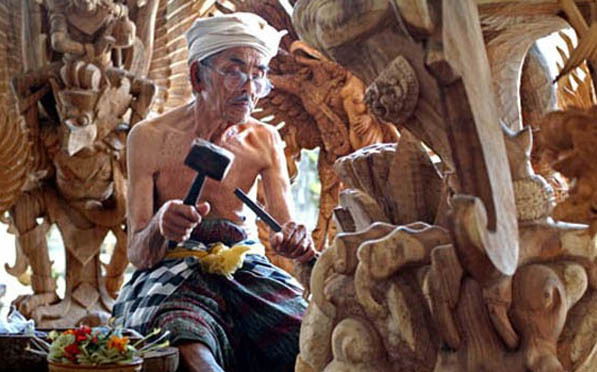 Mas is a center of wood carvings in Bali, almost all of the adult residents in the village of Mas can carve the wood with various forms and wonderful creativity, many families in Mas making wood crafts for sale and export. Here we will find many galleries from small to the big one to exhibit and sell wooden craft that has been recognized worldwide. The next place to visit in Ubud half day tour program is to visit The Ubud monkey forest, it is a nature protected area and also Hindu temple complex in Ubud, Bali, Indonesia. Its authorized name is the Sacred Monkey Forest Sanctuary (Balinese: Mandala Suci Wenara Wana), and its name as posted on its welcome board is the Padangtegal Mandala Wisata Wanara Wana Sacred Monkey Forest Sanctuary. The Ubud Monkey Forest is a famous tourist attraction which is frequently visited by over 10,000 visitors monthly. 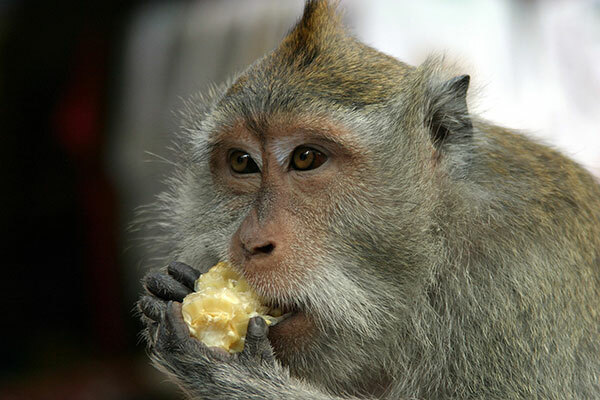 The population of monkeys that inhabiting Ubud monkey forest is recognized as the crab-eating macaque (the scientific name is Macaca Fascicularis), also referred to as the long-tailed macaque is a cercopithecine primate native to Southeast Asia. The following spot to go in the Ubud day trip is to visit the Ubud Palace, Puri Saren is an Ubud Royal Palace located within the center of Ubud Town and selected to be a must-visit place that is visited by many tourists every single day. Ida Tjokorda Putu Kande is the founder of the Ubud Kingdom who headed the kingdom from 1800 – 1823. Ubud palace is a central of art and societies whereas the market that is on the front side of it being a core of local community’s overall economy. Ida Tjokorda Gde Agung Sukawati has made his palace to be served as a place to stay for his guests of honor. In 1928, the Tjampuhan Hotel has been developed for the royal guests and in 1934, the hotel was chosen as the holiday accommodation for the royal guests as well as applied as the activity midpoint of Pita Maha Organization. The Tjampuhan Hotel is the earliest hotels in Ubud with a conventional design constructing combine to the surroundings. The last destination to visit in the half day Ubud excursion is to visit the Pura Taman Saraswati temple or commonly called as the lotus temple. 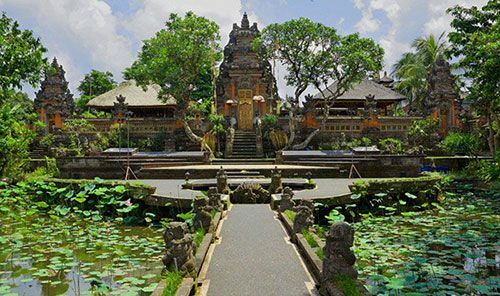 Saraswati temple is a beautiful water temple that has a pond filled with lotus plants located in downtown Ubud, Bali. Apart from that, the temple is a lot decorated by carving rocks showing the artistic creativity of the locals in Ubud. 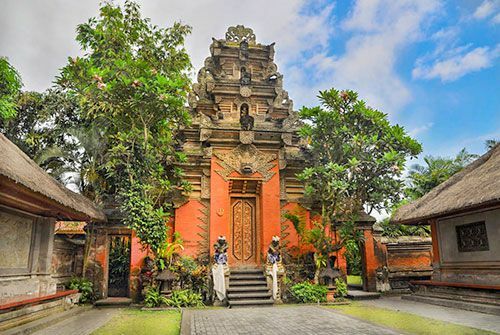 Saraswati Temple is a Hindu temple built in the 19th century on the orders of the royal family of Ubud to worship the Goddess Sarawati (goddess of knowledge). The half-day Ubud tour will end here, and we'll go back to the hotel. Below are the most frequently asked questions about Ubud Bali tour package, feel free to contact us for more information. What is included in Ubud Tour? What has not included in half day Ubud tours? What to bring in Ubud Trip? You can wear simple casual outfits, bring a bottle of mineral water to avoid dehydration (Bali island has high humidity), sunscreen to avoid skin burn (Bali is hot), Sunglasses, money (for lunch, entrance ticket, or shopping), medicine (if you're on treatment), camera/smartphone. How much the entrance ticket price to watch Barong dance? How much the entrance tickets in Ubud Sacred Monkey Forest? The entrance fee to visit Ubud Bali monkey forest is IDR 50,000 for adult, and IDR 40,000 for children (updated 2018), you can pay directly in the location. Can I touch the monkeys in Ubud monkey forest? No (it's not recommended for your own safety), do not touch the monkey, even they are friendly but sometimes they can attack if they feel disturbed, and please take care of your belongings (glasses, handbag, wallet, camera, phone, etc). What kind of food is available for lunch in Ubud tours? Almost all of the restaurant in Ubud serves many kinds of menus according to your taste (Balinese food, Indonesian food or Western food, etc). We will take you to the standard and nice one if you would like to have lunch in Ubud. I would like to stay longer in Ubud, can I extend the time? Yes, of course, we are flexible, but you will be charged for an additional hour (IDR 50,000/hour) and you have to pay directly to our driver. I'm interested in going for Ubud trip, how I book? You can simply contact us to book the half day Ubud sightseeing tour by mentioning the tour ID that is posted in every tour packages on our site (ex: BPT-UT-02 for Ubud Excursions) and you have to book at least one day before. How I pay for Ubud day tour package and how much the cost? The payment is by cash and the price is IDR 400,000 (Indonesian Rupiah), you can pay directly to our driver that come along with you for Ubud tour activities. We will convert the price if you would like to pay in other currency. Please be informed that the price of Ubud trip above is per vehicle (not per person).